I may be the only true Lyme Loony in the state, as a Lyme disease infected biologist that monitors (and even occasionally captures) loons. Even then, this would depend on definition, as I am not the only biologist in Montana handling loons that has been infected. As a bit of background on the statement, a Lyme advocacy group made a FOIA (Freedom of Information Act) request for Lyme related correspondences of NIH officials sometime last year. An email from a top official nearing retirement said (roughly) that he would miss the scientists, but not the “lyme loonies”. I wish disparaging remarks from officials like this one were isolated occurrences. 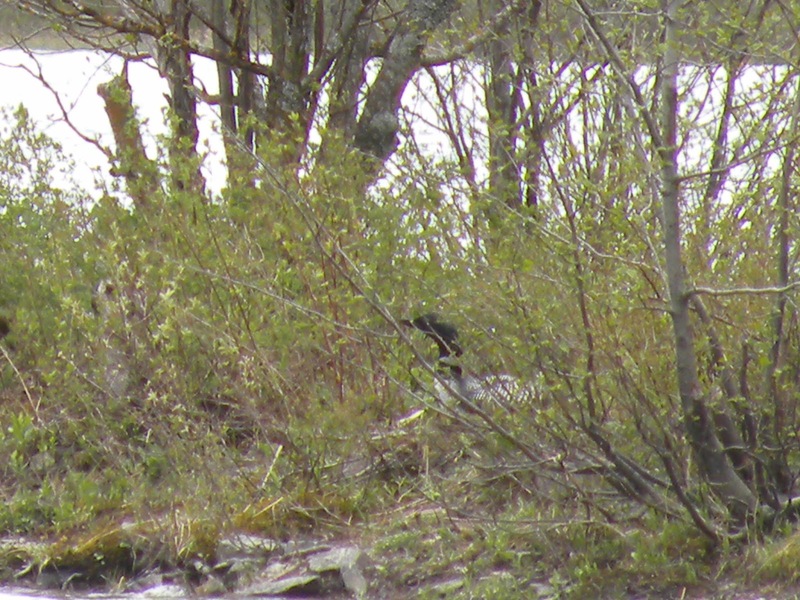 Loons, coincidentally, make many of the points I repeated often early on in my diagnosis about wildlife and ticks, science and logic as applied to Lyme, uncertainty in general, geographic distributions of ticks (and Lyme and tick-carrying wildlife), and attitudes toward Lyme patients. 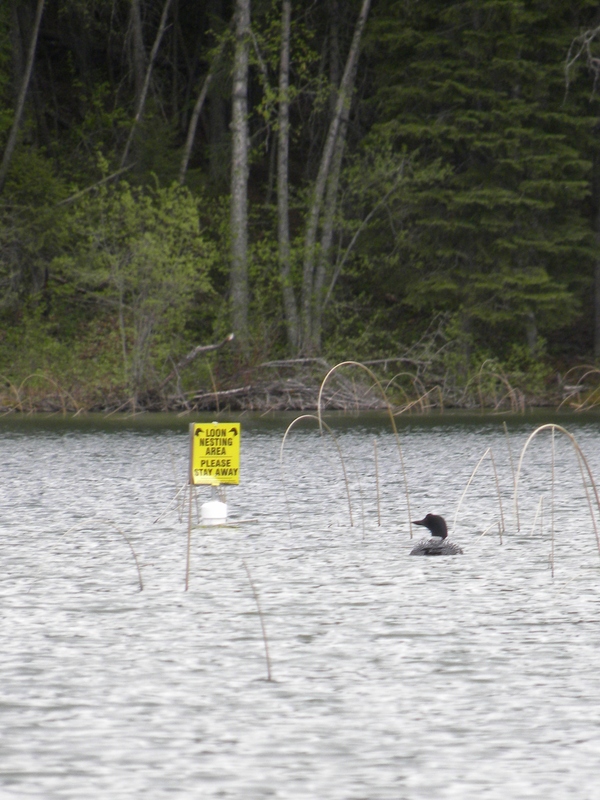 A Montana Common Loon investigates floating ‘keep out’ signs I placed for a nesting area. Loons don’t always follow the rules. I’ve delved farther into all of these subtopics in earlier posts, but in a nutshell, Loons don’t magically drop their tick passengers when they fly over the Montana border, nor do any other migratory wildlife species. If it took us (biologists and numerous state and federal agencies) decades and millions of dollars to gain a population and distribution estimate for grizzly bears in Montana, how are medical doctors able to so easily attest to the absence of an organism the size of a tick without even looking (or needing to reference any data or requisite survey efforts). Even if we don’t have deer ticks (which we can’t say with certainty), and even if the outdated assertion were true that deer ticks were the only species that could transmit Lyme to humans (which has been proven false through peer reviewed evidence), and even if there were some reason why a deer tick could not survive a day or season or year in Montana, why would they not be present here at least seasonally when brought here by wildlife hosts? Googling any combination of these factors will lead to articles and studies that I hope are part of an increasing body of evidence and available references to tick distribution information that is based on sound science. Insect bites are not the only method of transmission; mothers transmit Lyme to offspring and sexual partners can pass Lyme to one another (*These methods have been observed by physicians for decades and have been proven through peer reviewed research, including cultivation of the same strain of Lyme from the recipient following transmission. Contrary claims from CDC and IDSA doctors are not supported with research, data, or other evidence, nor are they supported by any physiological explanation of causal mechanism that would preclude transmission, in the instances where I have heard or read this claim). A loon nesting in tall, moist grass (as they tend to do) after migrating to Montana from Oregon, Washington, or California (as do all Montana loons that return for summer months). These are just a small example of the huge body of inconsistencies in the “Lyme politics” world. It is a very dirty arena, and a very exhausting place to reside if you are cursed with this disease in combination with any level of training or education in the sciences. An M.S. in Wildlife Biology, for example, makes it impossible for me to accept virtually any of the statements made by NIH, CDC, IDSA, or Montana doctors that are vocal on the issue regarding the natural history or distribution of any organism. Particularly without reference to what data or logic they used to reach their conclusions. It would take an enormous sampling effort to rule out the presence of any given tick species at the state level. None of the entomologists I’ve spoken to are aware of any large scale recent efforts in Montana. I find it hard to believe that any agency is funded well enough to undertake such a feat, even at a county level. And if any agency procured that level of funding, it seems the results of their efforts would be available somewhere, let alone referenced in the claims made about tick distribution. If a government agency charged with responding to disease precluded the possibility of a given disabling and potentially fatal illness based on the absence of a specific invertebrate species, and they had compelling evidence to this end, that it would be noted EVERYWHERE that this assertion is stated. Or at least occasionally when this assertion is stated. Or anywhere at all. ← Lime Lives in Montana ~ Help Doctors Help Patients!